A letter from a Hudson's Bay Company trader written in August of 1854 hits the auction block tomorrow as one of the oldest known letters ever written in B.C. A letter written in 1854 by a Hudson's Bay trader to his daughter was auctioned Saturday in Vancouver for $3,850. 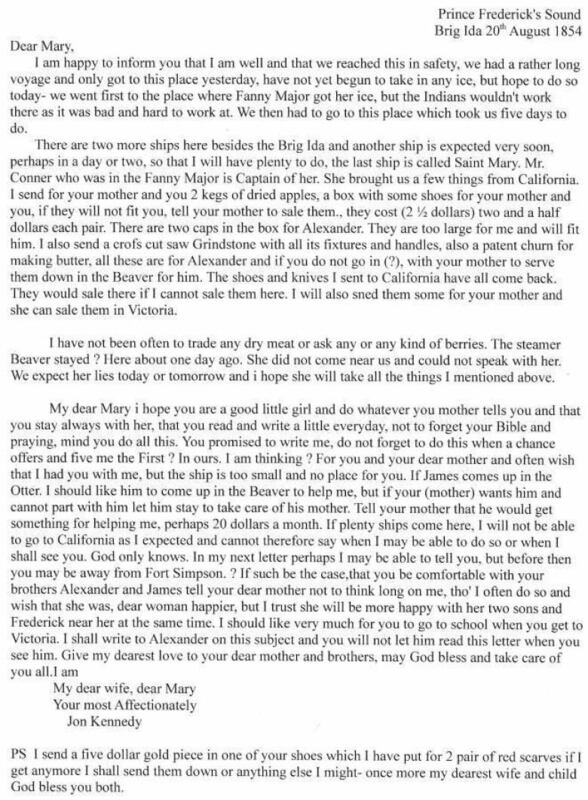 The letter from Hudson's Bay Company trader Dr John Kennedy, penned in August of 1854, is one of the oldest known letters ever written in B.C. Kennedy wrote it to his daughter, Mary, while stationed on a ship in Prince Frederick Sound, Alaska. Click here to view to full text of Dr. John Kennedy's letter. The auction was held by All Nations Coins and Stamps in Vancouver. Owner Brian Grant Duff says it was one of the first letters from what became colonial B.C. and an example of a postal system before there was one. "There was no postal service in those days so you had to send your letters by favour — basically on the next ship," said Duff. "It's neat to think of all these things travelling up and down the coast." Duff said Kennedy was the first Metis man to be educated at a European university, and was also one of the first medical doctors on the B.C. coast. "I would imagine there aren't many HBC employee letters like this that are outside the HBC collections or archives, so there aren't many in private hands." Previous to the auction, the letter belonged to the late collector Gerald Wellburn. Grant Duff said the new owner is a private collector living in B.C. so the letter will remain here. To hear the full interview with Brian Grant Duff, click the audio labelled: One of B.C. 's oldest letters up for auction. On mobile? Click here to view to full text of Dr. John Kennedy's letter.